The Department of Mechanical Engineering of the Hong Kong Polytechnic University (PolyU) has developed a novel technology of embedding highly conductive nanostructure into semi-conductor nanofibre. The novel composite so produced has superb charge conductivity, and can therefore be widely applied, especially in environmental arena. The innovation was awarded the Gold Medal with congratulations of the jury at the 45th International Exhibition of Inventions of Geneva, held on 29 March to 2 April this year. Semiconductor made into nanofibre of diameter as small as 60nm (less than 1/1,000 of a human hair) have been widely used in modern daily life photonic devices (such as solar cells, photocatalyst for cleaning the environment), and non-photonic devices (such as chemical-biological sensor, lithium battery). However, electrons and holes generated by light or energy in semiconductor would readily recombine, thus reduce the current or device effectiveness. Such nature has limited the further development and applications of semiconductor nanofibres. The novel technology developed by the research team led by Ir. Professor Wallace Leung, Chair Professor of Innovative Products and Technologies of the Department, have overcome such limitation. Applying electrospinning, the team succeeds in inserting highly conductive nano-structure (such as carbon nanotubes, graphene) into semiconductor nanofibre (such as Titanium Dioxide (TiO2)). The novel nano-composite so produced thus provides a dedicated super-highway for electron transport, eliminating the problem of electron-hole recombination. 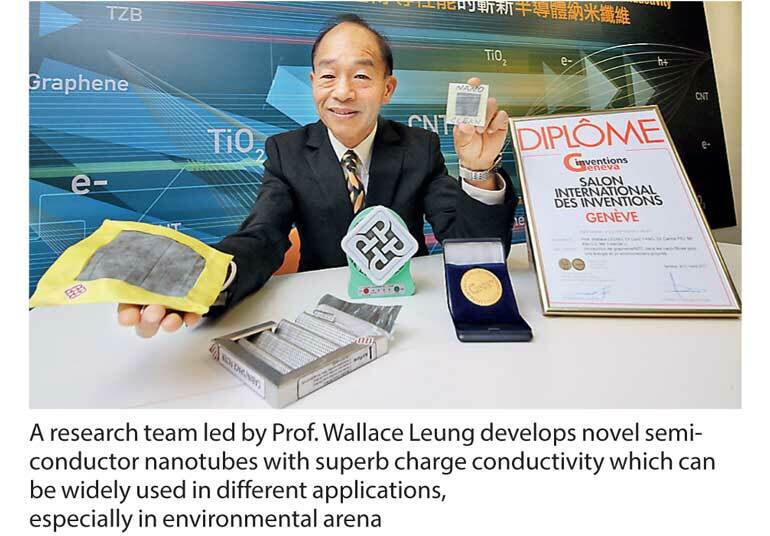 Amidst the potentially wide applications of the innovation in many spectrum, Professor Leung’s team has initially embarked on research of applying the novel nano-composite in two environmental aspects: solar cells, and photocatalysts for cleaning air. The latest generation of solar cells (e.g. dye sensitized solar cell (DSSC), perovskite solar cell) are promising clean and renewable energy sources. Yet, for more wide applications, there are still much room for further enhancing their power conversion efficiency and producing in more cost-efficient ways. By applying PolyU’s novel technology, carbon nanotube/graphene is embedded into the TiO2 component of DSSC and perovskite solar cell, boosting an increase of energy conversion from 40-66%. Compared to commercially available multi-crystalline silicon solar cell common in the market, with current price at US$0.25 (HK$1.94)/kWh, the cost of DSSC with carbon nanotube embedded is 12-32% higher (HK$2.18-2.56); while perovskite solar cell embedded with graphene is 28-40% lower (HK$1.17-1.40). Given the superb charge conductivity of the novel semiconductor nanofibre, there is great potential for prompt development of more efficient solar cells, and at lower cost, than the silicon cells. TiO2 is the most commonly used photocatalyst material in commercially available air-purifying or disinfection devices in the market. However, TiO2 can only be activated by ultraviolet light (i.e. about 6% of solar energy), thus limiting its wider application as it is less effective in indoor environment. It is also relatively ineffective in converting nitric oxide (NO) into nitrogen dioxide (NO2), at a rate of less than 5%. By applying PolyU’s novel technology, graphene roll is embedded into TZB composite (which mainly compose of TiO2). The novel semiconductor nanofibre so produced has superb conductivity, which provides a graphene superhighway for electrons to transport more quickly to oxide the absorbed pollutants. The technology also significantly increases the novel nano-fibre’s surface exposed for light absorption and trapping harmful molecules. Such novel semiconductor nanofibre can convert about 90% of NO to NO2, a 35% increase compared to composite without graphene. If compared to high-standard TiO2 nano-particles commonly available in the market, the conversion rate is even 10 times more, yet 10 times more cost-efficient. Given the wide uses of semiconductor nanofibre now and in the future, the PolyU groundbreaking technology that develops semiconductor nanofibre with superb charge conductivity has great potential for further development for different applications. Besides in solar cells and photocatalysts, other obvious examples of making use of such novel technology include the development of biological-chemical sensors with enhanced sensitivity and sensing speed, and lithium batteries with lower impedance and increased storage.